Conni went to law school with Holly, and we've been friends with the family for many years. They decided that they wanted to join us for 1.5 weeks so that Holly could fish. She's been an avid fisher for many years, having traveled to the Pacific to fish for Bonefish. 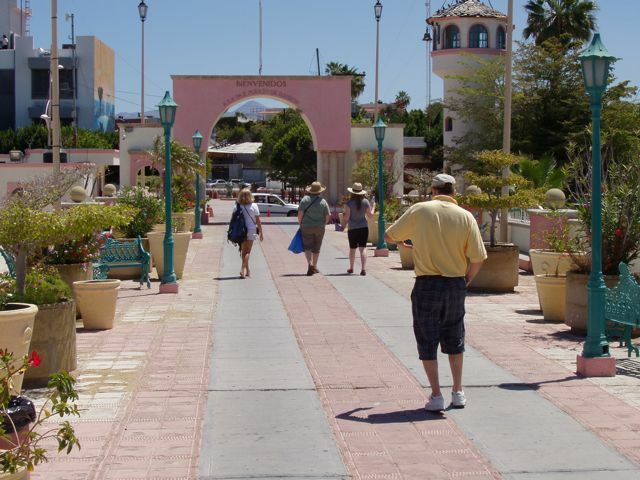 We spend an entire day touring La Paz with the family, grabbed some groceries, and headed for the island. We'll drop them in Lareto. Shopping in a corridor of small shops. 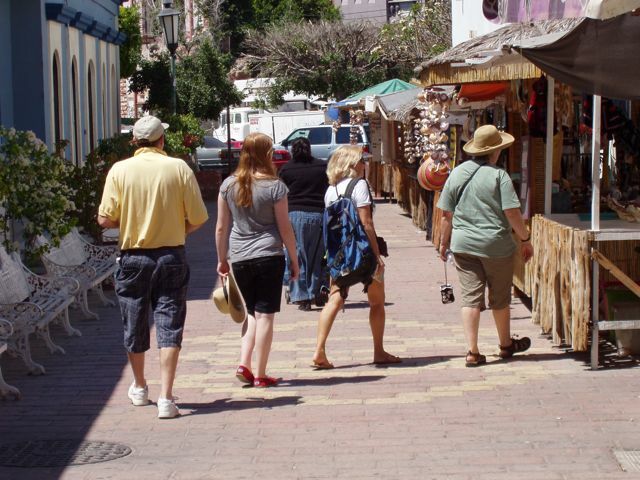 Finding tchotchkes in La Paz. 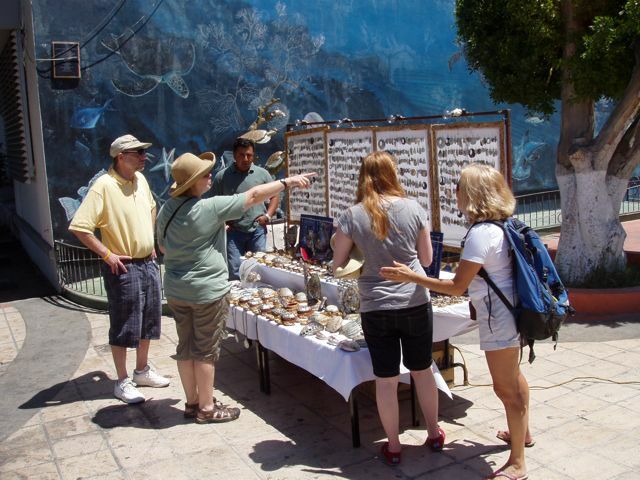 Holly found this vendor in front of the Weylend mural who was selling items hand made by he and his family. Fabricated of hand-polished abalone and mother of pearl, they were amazingly inexpensive. 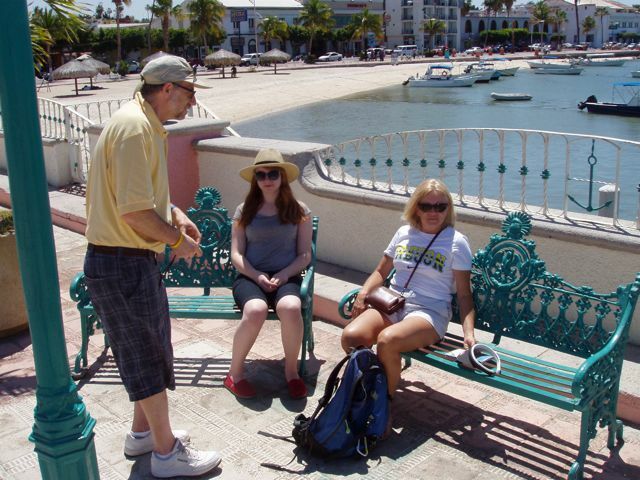 Richard and Emma discuss photography with Conni as they sit near the beach and Malecon. SUPER CONNI! If only she were wearing a big red "S" and a cape! 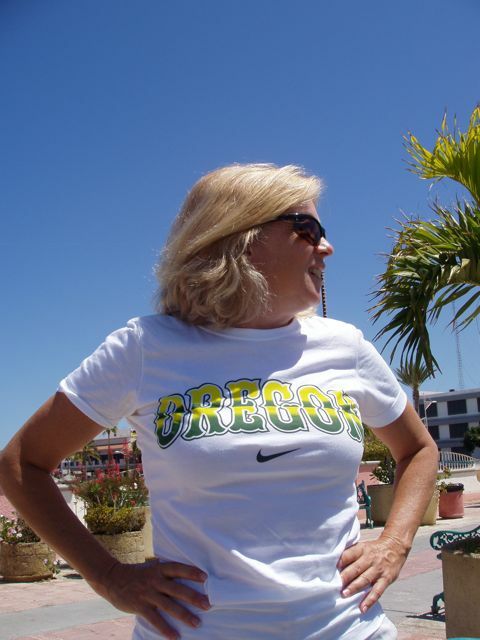 Lovely Conni has enjoyed wearing her Oregon shirt brought by Holly. 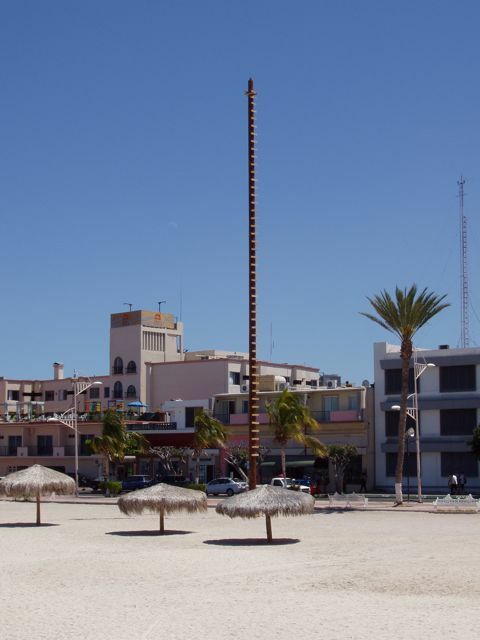 This tall pole erected on the beach in La Paz is the site and prop for local Danza de los Voladores (Dance of the Flyers). In this ancient Meso-American dance, the four "flyers" ascend the 90-m pole from which they hurl themselves. They have previously taken the precaution of winding the rope around the top of the pole and tied the end to their feet. While descending headfirst therefore, they circle the pole. Wish that we had seen this. We leave the area through the virtual port. The original was destroyed by a hurricane.